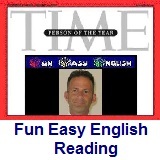 ﻿ Fun Easy English - reading practice and learning about the holiday International Jazz Day. The Day was proclaimed during the UNESCO General Conference in November 2011. The first annual International Jazz Day was kicked off in Paris by UNESCO Director-General Irina Bokova and UNESCO Goodwill Ambassador Herbie Hancock. UNESCO partners with the Thelonious Monk Institute of Jazz. Jazz is a music genre that originated at the beginning of the 20th Century, arguably earlier, within the African-American communities of the Southern United States. Its roots lie in the combining by African-Americans of certain European harmony and form elements, with their existing African-based music. Its African musical basis is evident in its use of blue notes, improvisation, polyrhythms, syncopation and the swung note. From its early development until the present day, jazz has also incorporated elements from popular music especially, in its early days, from American popular music. Talking of swing, Louis Armstrong, one of the most famous musicians in jazz, said to Bing Crosby on the latter's radio show, "Ah, swing, well, we used to call it syncopation, then they called it ragtime, then blues, then jazz. Now, it's swing. White folks - yo'all sho is a mess!" In a 1988 interview, trombonist J. J. Johnson said, "Jazz is restless. It won't stay put and it never will". I really love music and enjoy listening to jazz. I like drinking wine at night, especially cabernet sauvignon, and listening to jazz, basically any kind. 1. International Jazz Day is a yearly event on 30 April organized by which of the following? 2. The first annual International Jazz Day was kicked off in which city? 3. UNESCO partners with which of the following? 4. Jazz is a music genre that originated at the beginning of which of the following? 5. Trombonist J. J. Johnson said which of the following?